Below is a select list of news articles and other media coverage of LRC projects. For more information, contact Rebekah Mullaney, LRC communications manager. The LRC's Nadarajah Narendran recently spoke with LEDs Magazine on the future of 3D printing for solid-state lighting. “Everybody’s a bit concerned about having only one light source to choose from,” says Mariana Figueiro, director of the Lighting Research Center (LRC). “There is no R&D on any other light source. Everything is LEDs." Interview with Lori Brock, Head of Innovation Americas at OSRAM, on human-centric lighting, the current state of research, and commercial developments that are underway. USDA’s National Institute of Food and Agriculture recently awarded 16 applied research and development grants to enhance the development, adoption, and implementation of innovative, ecologically-based, sustainable integrated pest management technologies. A few simple ways to apply LRC Light & Health research in daily life. Three research initiatives at the LRC explore the potential of human-centric lighting. Research scientists Dr. Jaimin Patel and Leora Radetsky are exploring light as a way to mitigate disease. Their research looks at using visible and ultraviolet (UV) light against powdery mildew and downy mildew – two of the most common diseases in the greenhouse. "The Lighting Research Center has partnered with the U.S. Navy to test circadian lighting in submarines; it has collaborated with Mount Sinai Hospital in New York to evaluate the light’s use in recovery rooms for transplant patients; and it has worked with the National Institute on Aging to increase the comfort of people suffering from Alzheimer’s disease." LRC research is featured in this WSJ article on circadian lighting for hospitals. LRC's Dr. Nadarajah Narendran is acknowledged for his major contributions to the research and standards process that has enabled the broad adoption and commercialization of LED lighting. Exclusive with LRC Director Dr. Mariana Figueiro! New research shows that the “warm” screen color of Apple's Night Shift has a negligible impact on melatonin, although there could be a psychological effect, i.e., warm tones are cited as being more relaxing. Is 3-D printing the next frontier for the LED lighting industry? Drs. Nadarajah Narendran and Indika Perera discuss the possibilities for additive manufacturing in the LED and solid-state lighting industries. Dr. Mariana Figueiro offers her expert views on the importance of good lighting and circadian entrainment in the workplace in this article published in The New York Times. On November 30, LRC Director Dr. Mariana Figueiro presented a webcast with Ketra's Tom Hamilton, entitled, "Transforming Built Spaces with Healthy Lighting." In case you missed it, the webcast is now available on demand from LEDs Magazine. LRC Director Dr. Mariana Figueiro explains the results of human-centric lighting studies at five General Services Administration office locations in the US. Participants receiving prescribed dosages of circadian-effective light exhibited improved sleep and reduced depression and stress. Mariana Figueiro, LRC Director, discusses the science behind exposure to saturated colored light, and explains how doses of red and blue light can be used to promote daytime alertness and improve nighttime sleep. Carrie Meadows, associate editor of LEDs Magazine, attends the LRC's 2017 Partner-Alliance event and shares her observations on the research and programs highlighted by LRC scientists. This feature article profiles five recent and ongoing LRC projects that, through collaborations with the leading manufacturers and government agencies that comprise the LRC Partners and Alliances, are transforming the way we light the world. New color-changing lights that match the body's circadian rhythms have helped residents of a local senior living community see more clearly and sleep more soundly. Lighting standards expert Dr. Jianzhong Jiao details activity in IEC, IES, and the Lighting Research Center ASSIST program in defining LED lamp and luminaire testing standards that can enable fair comparisons by lighting designers, specifiers, and end users. In this article, Dr. Nadarajah Narendran discusses LRC research focused on LED system reliability, and the development of an accelerated method to accurately predict LED system life within a 3000-hour testing period. Workers who are exposed to sunlight or bright indoor lights during the morning hours sleep better at night and tend to feel less depressed and stressed than those who don't get much morning light, according to a recent study by the Lighting Research Center at Rensselaer Polytechnic Institute. LED light is able to reduce disease in plants, a discovery that could, ultimately, lead to the redundancy of expensive and unpopular pesticides. Interview with LRC scientist Dr. Jaimin Patel. Americans spend more than 90% of their time indoors, yet little attention has been given to understanding how light affects health in the built environment. A team of researchers at the Lighting Research Center (LRC) at Rensselaer Polytechnic Institute in Troy, NY, is working to change that. Experts reveal the technologies that are changing their day-to-day practices and the industry as a whole, featuring LRC scientists Mariana Figueiro and Mark Rea. The new lighting in Metro is like sitting in a Xerox machine. And it’s driving us crazy. Walking into an old Metro car is like walking into 1976, the year Metro opened. The fluorescent light in the 1000-series rail car is buttery, retro and forgiving, as if designed to flatter Robert Redford in "Three Days of the Condor." You've probably heard of circadian rhythms, the natural body cycles that help us to do things like fall asleep at nighttime and be active during the day. Now, a group of researchers are working to manipulate those rhythms to make us more productive at work. In a project funded by the U.S. General Services Administration (GSA), LRC researchers are investigating how to effectively use electric lighting to ensure that every worker receives enough light during the day to support health and wellbeing in the office environment. In the most recent issue of Architectural Lighting magazine, LRC scientists Mariana Figueiro and Mark Rea explain how to quantify circadian light and its impact. The article was also published online, and quickly rose to become one of the most popular and widely-shared on the magazine's website. Dr. Narendran discusses the LRC's newly expanded M.S. in Lighting program, which now includes a paid externship at a leading lighting manufacturer, design firm, or government organization. There may be hope for illuminating the minds of the almost 50 million people who suffer from dementia. At the upcoming Strategies in Light conference (February 28–March 2, 2017; Anaheim, CA) the lead speaker in the Non-Visual Effects of Lighting session will be Dr. Mariana Figueiro, Light and Health Program Director at the Lighting Research Center. Two new studies find that electronic device use near bedtime is linked with poor sleep in children and adults. Until we know more, it is recommended that lighting in health care facilities should be designed to minimize acute melatonin suppression in night shift workers. LRC Light & Health Program Director Mariana Figueiro is featured in this article in the November issue of Scientific American exploring the science of why electronic screens keep you awake at night and what you can do about it. Scientists from the Lighting Research Center are planning to install LED lighting with fixture-integrated and network-connected lighting controls in a 25,000 sq ft commercial office on the Rensselaer Technology Park campus. The Lighting Research Center proposes a metric for applying circadian light in the built environment. In the past year, the LRC has set a course to support the SSL industry through research that shows the value of lighting beyond energy savings. Embracing the trends toward customization and data analytics, SSL research is now evolving to include new developments such as the Internet of Things and 3D printing. "It is very difficult to suppress melatonin," said Mark Rea, director of the Lighting Research Center at Rensselaer Polytechnic Institute. Staring directly at a light source, like a computer screen, may cause the greatest effect on sleep cycles—but the effect is still weak. An indirect light source, like a street lamp outside the window, isn't likely to affect sleeping at all, Rea explained. A roundtable panel featuring John Bullough, LRC Director of Transportation and Safety Lighting, speculates on the implications of driverless vehicles. The Lighting Research Center at Rensselaer today announced that world-renowned plant pathologist Jaimin Patel, Ph.D., has joined the center, further strengthening the LRC's horticultural lighting and plant pathology program. A report created by the Lighting Research Center is posted on the Bonneville Power Administration website detailing tests of LED luminaires and control systems in open office and conference room spaces. "The ASSIST-sponsored internship is a great opportunity for students to receive mentorship in a research and career field that they may not be aware of, as well as a chance to present their work to organizations that may hire them in the future," said Nadarajah Narendran, the LRC's director of research and organizer of the ASSIST program and internship. "It's a long putt from lighting to mood. There are a lot of things in between we don't fully understand," says Mark Rea. Architectural and landscape lighting can be designed so that it is sensitive to the night sky and ecosystems yet still responds to clients' requirements. Science has shown the correlation between light exposure and the human circadian cycle, but what does it take to implement a circadian lighting solution in a built environment? "Lighting touches every human endeavor," Rea said. "Over the past 30 years, much of what we've accomplished, from improving lighting standards to educating the next generation of lighting practitioners, is rooted in collaborative research with very diverse stakeholders, each with their own unique perspective on lighting." Sen. Tim Kaine on transportation, news from the FAA on DC airports—and headlight aim, featuring the LRC's John Bullough. NYSERDA and NYSDOT announce new LED street lights to make Central Ave. safer and reduce energy costs. The project is being led by John Bullough of the LRC. The original news release is available here. The LRC's response to the AMA report on LED lighting attempts to draw attention to the problem of misapplying short-hand metrics to the topic of light and health. Charlie Jarboe, a recent graduate of the M.S. in Lighting program at Rensselaer, wrote an Emerging Professional column for LD+A, which addresses issues affecting those new to the industry and students considering a career in lighting. LRC Light & Health Program Director Mariana Figueiro is featured in this Fast Company article on sleep tracking apps. This feature article profiles five lighting projects presented at the LRC Partner-Alliance Event last October. Projects include the Galle Fort in Sri Lanka, Breathing Lights, Lighting Patterns for Healthy Buildings, Cypress Cove memory care facility, and LED airfield lighting. Interview with LRC's DELTA (Demonstration and Evaluation of Lighting Technologies and Applications) program director Jennifer Brons. "The idea is good, but it is not just about color. The intensity matters too, so color needs to be shifted and intensity needs to be dropped," said Mariana Figueiro in this CNN article, which was picked up by more than 100 news outlets across the U.S.
Mariana Figueiro's group is "working on an app that would gather information about your light exposure across a day and recommend the best times to get the right light. With remote-controlled, color-variable bulbs from Hue and others, she suggests a future in which this app could change overall lighting to fit your needs...". LRC's Mariana Figueiro speaks with the San Francisco Chronicle about the effect of light on sleep. Article later reprinted in the Houston Chronicle. Must read article on healthy lighting in long-term care facilities, featuring the research of LRC Light & Health Program Director Mariana Figueiro. LRC Light & Health researchers are conducting studies at hospitals and long-term care facilities across the U.S. to measure whether intense light therapy affects wellbeing of older adults with Alzheimer's. One of the facilities was featured in this inspiring local news story. LRC senior research specialist and recent Rensselaer graduate Kassandra Gonzales discusses her career path in the emerging field of light and health. A growing field of research suggests that surrounding ourselves with the right dose of electric light can boost mood and cognitive function, especially for those most susceptible to sleep disorders. Elizabeth Donoff, Editor-in-Chief, Architectural Lighting magazine, interviews LRC Director Mark Rea. LRC Director Mark Rea discusses 'benefit metrics' in this final installation of the LD+A series, "The Value Proposition." Panel discussion featuring LRC Professor Mariana Figueiro, Kevin Kampschroer of the U.S. General Services Administration (GSA) and Mary Beth Gotti of GE Lighting. 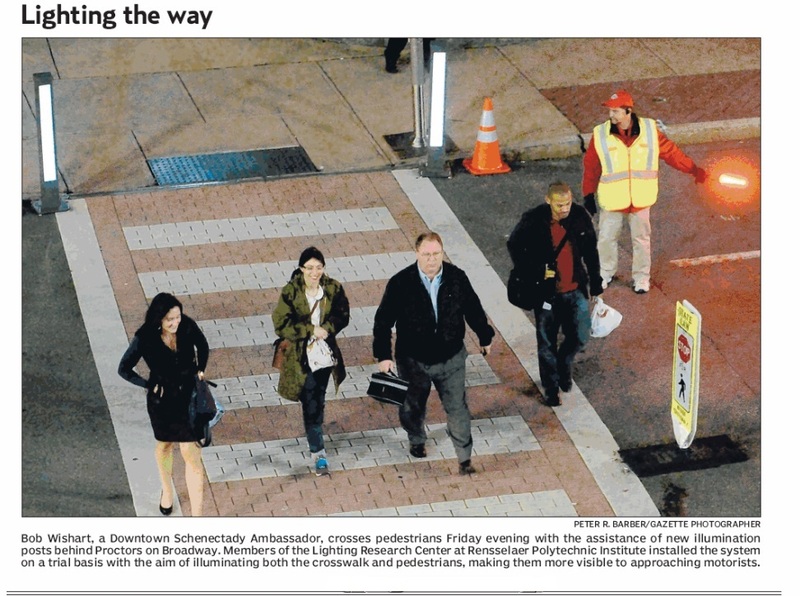 LRC's John Bullough conducted a demonstration of a prototype crosswalk lighting bollard system in downtown Schenectady, N.Y.
LRC students design new lighting for the Thomas Edison and Charles Steinmetz memorial statues in Schenectady, N.Y.
Panel discussion on the critical link between light, sleep and student performance, featuring LRC Director Mark Rea. Benita Zahn visits the Lighting Research Center to speak with Mariana Figueiro about a new study utilizing tailored lighting to benefit individuals with Alzheimer’s disease. LRC Director of Research and Rensselaer professor N. Narendran discusses the development and benefit values of solid-state technology through industry collaboration. Jessica Bloustein Marshall of WAMC Northeast Public Radio visited LRC's adaptive matrix headlight test site to speak with John Bullough. Through a collaborative effort, the cities of Albany, Schenectady and Troy, plan to illuminate up to 300 vacant homes over several months. Working with lead artist, Adam Frelin, lead architect, Barbara Nelson, and the Lighting Research Center at Rensselaer Polytechnic Institute in Troy, this multi-site installation aims to regenerate interest in once-vibrant neighborhoods that currently have high vacancy rates. The Lighting Research Center (LRC) has announced a new research effort focused on the use of advanced LED headlamps and adaptive control of the high beams for driver safety as opposed to the use of separate low-beam lighting. John Bullough is featured on the front page (A1) of the Sunday Times Union newspaper re: his study of Advanced Headlight Systems for LRC's Transportation Lighting Alliance, including Audi A7 "matrix lights." Inside the Lighting Research Center at RPI, soothing fluorescent lights flicked on when the sun went behind a cloud and then dimmed when it came back out. And when people left the room, the lights flicked off, even though nobody touched a switch. It was a glimpse of how buildings would be lit in the future. The center had its sights set on a lofty goal: to become the top lighting research center in the world. Screens before bedtime harm sleep. The effect is biggest for teenagers. Mariana Figueiro's latest study on sleep and light from self-luminous devices is featured in this audio piece that was on the homepage of Economist.com. Through LRC's new program OLED-LEAP "companies will learn how to develop lighting systems that will best take advantage of the unique characteristics of OLEDs and deliver greater value to users," said Dr. Narendran. LRC Educational Programs Director Daniel Frering discusses the development of certification programs within the lighting profession. LRC's Transportation Lighting research is featured in this article by Stephen Rynkiewicz. "We can take for granted that LED headlights and signal lights are going to be bright enough and use a lot less power," says John D. Bullough, senior research scientist at the Lighting Research Center. "So now the focus is on performance..."
Excellent article by Ry Crist on our new program OLED-LEAP. "Organic light emitting diodes (OLEDs) might be the next big thing in lighting. Like regular LEDs, they promise dramatic cuts in power consumption, and with a naturally diffused glow that's a lot easier on the eyes, the potential for creative new design applications is immense. A new program at Rensselaer's Lighting Research Center seeks to make OLED lighting more practical to manufacture and more affordable..."
Michael Grothaus interviews Mariana Figueiro for this article on iPads and sleep. Along with their energy-sparing advantages over high-pressure sodium, LEDs' color temperature brightens outdoor spaces in ways that can increase safety and comfort around roads and streets. Yet solid state lighting's properties are best suited to certain settings, says John Bullough, senior research scientist at the LRC. LRC's John Bullough presents the need for a valid benefit metric to lead us toward new ways to light roadways. and a school in Sweden’s far north that has recently installed special lighting to improve mood, raise performance, and help students through a long, dark winter. Excellent article by Bob Tedeschi with expert quotes by Dr. Narendran. Mariana Figueiro speaks with Carolyn Johnson about a new study which confirms her 2012 study results that show backlit tablets can suppress melatonin, delaying sleep. Dr. Thorbjörn Laike speaks with Radio Sweden about light & health research with LRC and the Daysimeter (in English). Professor Emeritus Peter Boyce presents an action plan to more clearly demonstrate the benefits of lighting. Dr. Narendran, director of research and head of the solid-state lighting program at the LRC, was interviewed by BBC World News regarding the Nobel Prize in physics given to the inventors of the blue LED. Mark Rea and Nadarajah Narendran talk to AP Science Writer Malcolm Ritter about the Nobel Prize for the blue LED. The AP story was featured in newspapers and TV news around the world including ABC News, CBS News, NBC News, Businessweek, Houston Chronicle, San Francisco Chronicle, Sacramento Bee, The New Zealand Herald, and Hindustan Times, among many others. Even the most efficient light sources would be rendered useless without high-quality optics. A compact fluorescent lamp, for example, can lose up to 70 percent of its light if paired with an inappropriate optic, says Nadarajah Narendran, director of research at the Lighting Research Center (LRC), in Troy, N.Y.
Mariana Figueiro's Light & Health research is featured in this article by Claire Thompson. Part 2 of a two-part series exploring light's effect on human health. In-depth article on Mariana Figueiro's recent study, "Tailored lighting intervention improves measures of sleep, depression, and agitation in persons with Alzheimer’s disease and related dementia living in long-term care facilities." LRC Light & Health Program Director Mariana Figueiro will speak at TEDMED, September 12, 2014 at the Kennedy Center in Washington DC. The third article in a multi-part series examining the critical issues in solid-state lighting, with expert quotes from Dr. Mark Rea. The article ran in the July/August issue. The U.S. Department of Transportation has chosen LRC/Rensselaer as its University Transportation Center (UTC) Spotlight Institution for the month of July! Article by Maury Wright on the National Academies report co-authored by LRC scientists John Bullough and Leora Radetsky. Expert quotes by Nadarajah Narendran and Yiting Zhu. Dr. Mariana Figueiro's Light & Health research is profiled in the May/June issue cover story by Rosie Blau, also available online. The second article in a multi-part series examining the critical issues in solid-state lighting, with expert quotes from Dr. Nadarajah Narendran. The article ran in the May/June issue of the magazine. The Value Proposition: Where Are the Products? Column by Dr. Mariana Figueiro on new metrics to increase the value of lighting. "The non-visual benefits of light on human health are real and multifaceted, but remain largely unrealized because there are few lighting products designed to deliver those benefits." has been evaluating the potential effects of adaptive high beam systems on nighttime crashes while driving, and, he says, there do seem to be real benefits." Dr. Nadarajah Narendran's LED research is featured in the May issue of Photonics Spectra magazine, also available online. Thanks very much to everyone for the overwhelming positive feedback about LRC Director Mark Rea's Strategies in Light talk. In case you missed the SIL talk, here is a summary by Maury Wright, published in the April/May issue of LEDs Magazine. WSJ Gear & Gadgets editor Michael Hsu's guide to finding the best LED light bulb. Expert quotes by LRC Director Mark Rea. Cristina Quinn speaks with Mariana Figueiro about the effect of light from self-luminous displays on sleep. Benita Zahn visits LRC to speak with Mariana Figueiro about a new study utilizing blue light therapy to improve sleep for older adults. The first article in a multi-part series examining the critical issues in solid-state lighting, with expert quotes from LRC's Nadarajah Narendran and John Bullough. The article ran in the March/April issue of the magazine. LRC Director Mark Rea and science writer Eli Chen discuss the benefits of regular light/dark patterns to promote human health. to a better night's sleep for elderly people. How light therapy can treat disorders from depression to Alzheimer's disease. The Lighting Research Center is no stranger to the health and wellness movement. "It is high time to put value back into engineering... In lighting we are collectively trying to develop benefit metrics that, by definition, can be measured. And if the benefit can be measured, it can be engineered. But this means we have to go beyond the standards by specifying the benefits and then engineering them," writes LRC Director Mark Rea. it now looks like LED bulbs may be eclipsing them. Robert Siegel speaks with Mariana Figueiro about utilizing light to improve human health and wellbeing. In the Dark About Picking a Light Bulb? NPR spent the day at LRC and recorded two amazing stories: In the first piece, Robert Siegel investigates the quality and color of LEDs and the "lighting of the future" featuring N. Narendran and Mark Rea. The biggest changes in the home lighting market have come in the realm of the light-emitting diode, or LED. Bob Tedeschi and Russ Leslie talk about the bright side of these new bulbs. Column by LRC Director Mark Rea on new metrics to increase the value of lighting. Good intentions and discussions of lighting quality are important, but to engineer lighting value we have to be able to measure benefits as well as costs. Washington Post columnist and TODAY contributor Elizabeth Mayhew analyzes the federal law ending production of 40- and 60-watt incandescent light bulbs and provides some details on the LED light bulbs recommended as replacements. A bright future for the above-the-road lighting market, with predictions of more intelligent solutions to deliver enhanced efficiencies and light when and where it's needed. The LED lighting industry needs to focus more on the benefits of solid-state lighting (SSL) technology rather than purely on energy savings, according to Strategies in Light Plenary speaker Mark Rea, as he discusses in an interview with Maury Wright. Interview with LRC's Andrew Bierman on LED Christmas Lights! Mariana Figueiro Q+A: Lighting Research Center study on lighting systems for Alzheimer's patients could help an aging population. The fancy neck charm this lemur is wearing is no fashion accessory. Weighing in at just under an ounce, it’s a battery-powered data logger that measures light exposure and activity levels continuously over many days. In some families, favorite recipes are handed down for years. Someday, if Tessa Pocock has her way, greenhouse workers will have time-tested recipes for light that grow better plants. Properly manipulated, wavelengths in light can make plants grow faster or slower, produce more healthful compounds and even have a longer shelf life after being picked. There’s an old joke that goes: How many PhDs does it take to turn on a lightbulb? The punchline: Four—one to do it and three to co-author the paper. That may not be fair, or true. But it is the case that it takes a number of highly intelligent people to undertake the necessary work at the Lighting Research Center at Rensselaer. When it comes to dimming LEDs, confusion reigns: they don’t always combine well with legacy control systems and there is no set definition of what acceptable ‘dimming’ really is. Amanda Birch looks at a study that aimed to work out what people want and sets parameters to help manufacturers achieve it. an innovative type of skylight designed by the LRC with funding from NYSERDA. Light scoops provide optimal levels of daylight throughout the changing seasons and daily fluctuations in weather by capturing and strategically redirecting daylight into buildings. Ask Umbra: Do the costs of LEDs outweigh the benefits? Like many other aspects of home design, options for lighting have proliferated over the past decade or so. Even buying a light bulb isn't as simple as it used to be. Late-night screen time may be leaving us sleepless and saddlebagged. In a Hollywood conference room, researchers from the Lighting Research Center (LRC) and product engineers from OSRAM Sylvania capped off eight years of research and concept development with a field demonstration that speaks to LED's potential as a flexible lighting solution in office environments. Speaking as earnestly as an iPad is backlit, Arianna Huffington implored attendees at the Aspen Ideas Festival Wednesday to ban their tablets and smart phones from their bedrooms, for the sake of their health. The Lighting Research Center has developed a concept for roadway illumination called “Ecoluminance” which incorporates roadside vegetation with low-level pedestrian and landscape lighting, retroreflective markers, and light-emitting diode (LED) road and walkway illumination. Erin Ryan, a graduate student pursuing her master’s degree in lighting at the Lighting Research Center is the recipient of a $15,000 Illuminating Engineering Society (IES) Graduate Grant. The Lighting Research Center at Rensselaer has released a new publication in the ASSIST (Alliance for Solid-State Illumination Systems and Technologies) series that recommends how lamps should dim regardless of type of light source. An interview with the LRC's DELTA (Demonstration and Evaluation of Lighting Technologies and Applications) program director Jennifer Brons. Have questions about how new lights might look in your home? Rensselaer Polytechnic Institute has created a free web page to see how they might look before you buy. Created by RPI's Lighting Research Center, the site is meant to help homeowners, contractors and builders choose light bulbs, fixtures and controls to boost energy savings, calculate costs and get light where it is needed. The right lighting can make a world of difference, especially if you spend long hours in front of a computer. But there's more to choosing the best lights for your home office than you might think. The Lighting Research Center at Rensselaer Polytechnic Institute has launched the first interactive website to help people choose the right light bulbs, fixtures and controls for every room in the house. NYSERDA-funded web tool helps homeowners to lighting designers consider different lighting installations in the various rooms typically found in a home, and choose products and design elements that are both functional and efficient. A review of the book authored by the Director of the LRC, Mark Rea..
Paul Tarricone lends his thoughts and opinions on the occasion of the Lighting Research Center's 25th Anniversary. More than 175 guests from around the world came to Troy to celebrate the 25th anniversary of the Lighting Research Center (LRC) at Rensselaer. "Heat is one of the problems with LEDs," Narendran says. "If you don’t create it in the right way, you may not have the long life.” His device inverts the typical design by putting the LED source and the metal heat sink at the front of the bulb, where there is more exposure to surrounding air and cooling is more efficient. The bulb has interior features that reflect and refract to produce light distribution that mimics an incandescent lamp. Of the many design challenges facing LED-based solid-state lighting (SSL) applications, perhaps there is none greater than that of expectations. You may not need—or want—the brightest, zillion-lumen headlamp, flashlight, or bike light you can buy for your outdoor adventures. Here, we slice through the darkness. It was about a million years ago, many experts believe, in what is now South Africa, when humans learned to control light and drive out darkness by mastering fire. LEDs have entered the residential market, giving architects an array of good—and bad—options. Researching the right LED product is time well spent. The Lighting Research Center at Rensselaer Polytechnic Institute in Troy, NY has attracted more than $100 million in funding since its founding 25 years ago. The value of light is typically measured in dollars, color temperature, or efficacy. But how does one quantify the sense of security that light provides in a parking garage, or the increased productivity of workers in a bright factory? Can a measurement be placed on the amount of security a light can provide? The comfort derived from its presence? Or its ability to create the ideal atmosphere for reading? Some nights, unusual lights beam out of the Gurley Building on Fulton Street. They are the product of lighting research being conducted at Rensselaer Polytechnic Institute's Lighting Research Center; research that will now be aided by equipment at its new Photometry Lab, unveiled Wednesday night. On its 25th anniversary, Rensselaer Polytechnic Institute's Lighting Research Center celebrated the opening of an important lab that measures light. Zia Eftekhar, the retired chairman of Philips Lighting, recently sat down with Mark Rea, director of the Lighting Research Center at RPI, to discuss the potential for a new measurement system in lighting that would emphasize non-visual, qualitative issues (e.g., worker productivity, student learning, sleep), rather than the traditional quantitative benchmarks that focus on energy use. Sleep-starved teens may be able to rest easier, according to new research from the Lighting Research Center (LRC) at Rensselaer Polytechnic Institute. John Bullough of the Rensselaer Polytechnic Institute's Lighting Research Center, was honored this morning in Orlando for having the best presentation in the detection portion of the Research Foundation's 2012 symposium. What's the right light for your living or family room? Versatility is vital if you want a multipurpose setting for throwing an intimate dinner party, knitting or playing Wii. Here are some illuminating tips from local lighting experts. Rory Sutherland, vice chairman of Ogilvy Group UK, will give the keynote at the Lighting Research Center's 25th Anniversary Celebration, March 20, in Troy, N.Y., as part of the "Lighting Value Forum." New research carried out jointly by the Lighting Research Center and Penn State have identified links between visibility and safety from roadway lighting. The results are said to hold promise for predicting the safety benefits of new lighting configurations. Researchers from the US Lighting Research Center (LRC) and Penn State University have recently published a paper entitled "To illuminate or not to illuminate: Roadway lighting as it affects traffic safety at intersections". Research predicts the impact of LED-based roadway lighting that provides improved visibility in terms of the reduction in night-time accidents in intersections. As we move from paper books to e-books, the practice of reading before bed may have to change. A new study suggests that looking at the bright light of a tablet screen may be interfering with the natural production of hormones that aid in falling asleep. Since light impacts more than just our vision, it is important that lighting schemes implemented in senior residences also account for the needs of our non-visual systems. Roundabouts, also known as traffic circles, are increasing in number across the U.S. These intersections generally increase traffic throughout while reducing severity of automobile accidents. People who favor watching movies or surfing the web on their tablet or laptop before bedtime could be setting themselves up for serious sleep problems, according to a new research. Using a tablet or computer in the late evening disrupts the body's melatonin production. As 2012 comes to a close, scientists and engineers are looking forward to molding the future, starting with the work they do in their own labs. Phys.org has interviewed a few of today's leading researchers in the areas of energy and lighting, and asked them what they're most excited about in their fields in the years to come. The Lighting Research Center (LRC) at Rensselaer Polytechnic Institute will celebrate 25 years of lighting research and eduction on March 20, 2013. Full disclosure: We love the interwebs here at HuffPost Teen. Between the amazingly creative work you are sharing on Tumblr, the social media empires you've built, and the way you've made your voices heard on platforms like ours (and beyond), we're inspired every day by your rich online lives. When passengers on the newest Boeing commercial airliner find cabin lighting that can mimic an infinite blue sky, or simulate sunrise and sunset, the technology to make that happen was born at the Rensselaer Lighting Research Center in downtown Troy. Drivers who feel antsy about navigating through traffic circles — also known as roundabouts — may breathe a little easier when approaching them in the future. Turn your gadgets off at night to sleep better. Your computer, tablet, and smartphone may be sabotaging your sleep, according to a recent study from the Rensselaer Polytechnic Institute. In 1957, legendary writer Truman Capote described himself as a "horizontal author," claiming that he couldn't think unless he was "lying down, either in bed or stretched on a couch." In a new study from the Lighting Research Center, it was found that short-wavelength light can enhance the cortisol awakening response, which is important for dealing with stress throughout the day, in sleep-restricted adolescents. The study also concluded that reduced evening light exposure may influence the cortisol awakening response. The formula can be used to adjust glazing placement and solar orientation early in the design process. Had it not been for a design research seminar while a graduate student at the Lighting Research Center (LRC), part of Rensselaer Polytechnic Institute in Troy, N.Y., Mariana Figueiro might never have pursued a career in lighting education and research. Even with the shift to standard time this Sunday, the days will continue shortening, making it even tougher to get up. Less light signals the body it's still night. But early morning exposure to an iPad, computer or other backlit device could help ease the seasonal transition, according to a study from the Rensselaer Polytechnic Institute. According to the Centers for Disease Control and Prevention (CDC; Atlanta, GA), almost 70 percent of adolescents get less than 8 hours of sleep on school nights, which has been linked with depression, behavior problems, poor performance at school, drug use, and automobile accidents. We've told you about recent studies that show tablet and smartphone use before bed can keep you awake at night. Researchers at the Lighting Research Center at Rensselaer Polytechnic Institute found two or more hours of exposure to backlit devices suppresses melatonin by as much as 22%. Light-Emitting Diode (LED) airfield lighting is increasingly used at airports in the United States and abroad, largely because of the potential for this technology to produce substantial savings in terms of maintenance and energy costs. Additionally, Rensselaer Polytechnic Institute's Lighting Research Center found that looking at the backlit screen of certain electronic devices can suppress melatonin, a hormone produced during sleep, and cause sleeplessness. When the Boeing company and the FAA needed to develop innovative, efficient lighting solutions, they turned to Rensselaer's Lighting Research Center. Having trouble getting to sleep? It could be your iPad, your Kindle or any other screen you use for reading before turning the lights out. New research explains why this happens, but what can you do about it — short of giving up your device? Researchers from the Lighting Research Center have proposed a new metric to help architects and green builders design with daylighting at an early stage. Researchers at the Lighting Research Center at Rensselaer Polytechnic Institute have proposed a new metric to help architects and builders more easily take advantage of the benefits of daylighting, from significant energy savings to the positive impact of light on health, when designing the built environment. The Alliance for Solid-State Illumination Systems and Technologies (ASSIST), an industry-sponsored organization, is celebrating its 10th anniversary. Keeping company with an iPad far into the evening may keep you amused, but it may also rob you of some sleep later in the night. Really? Using a Computer Before Bed Can Disrupt Sleep? In today's gadget-obsessed world, sleep experts often say that for a better night's rest, Americans should click the "off" buttons on their smartphones and tablets before tucking in for the night. Using tablet computers like Apple's iPad and Samsung's Galaxy Note just before bed can lead to a poor night's sleep, according to research. Your new tablet may be convenient for reading on the go, but it may not be so good for your sleep. "Our study shows that a two-hour exposure to light from self-luminous electronic displays can suppress melatonin by about 22 percent," said lead researcher Mariana Figueiro in a statement last week. Is setting down your iPad the last thing you do before bed? New research shows that all of those nighttime hours spent with your tablet can wreak havoc on your sleep. Are you having more trouble sleeping since you got your iPad or Samsung Galaxy S II? That comes as no surprise to researchers at the Lighting Research Center at Rensselaer Polytechnic Institute, who've found that two or more hours of exposure to backlit devices suppresses melatonin. Want a Good Night's Sleep? Read a Book. There are many ways to slide into a good night's sleep -- here, we're concerned with just one of them: reading. And if you take to bed with a good book on your tablet, you're doing it wrong. Energy-efficient streetlights may change color of light pollution. Flicker and stroboscopic effects have been a concern with solid-state lighting (SSL), and industry and the ENERGY STAR program have debated recently the effects of frequency and other driving modes on the perception and acceptability of flicker. The LRC has published a new ASSIST recommends publication that is designed to help LED lighting manufacturers develop systems that minimize the effects of flicker. The Lighting Research Center at Rensselaer Polytechnic Institute has published a report to help guide airports as they consider LED lighting for various needs around an airfield. The Lighting Research Center and Osram Sylvania used a DC-powered grid, modular tiles, and wireless controls to implement a cloud-like LED lighting system in a Paramount Pictures conference room.